"A Boy Named Sue" Aaron and the Original Sue - Sue S. or Sue the Lawyer. 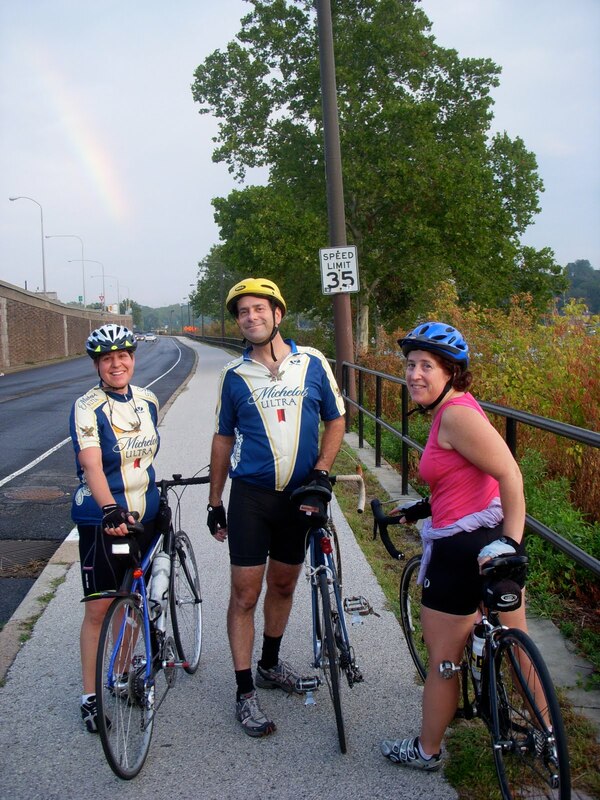 My morning biking buddies, aka the Sue Crew and I are are winding down our cycling season. The mornings are much darker and cooler at 6:15/6:30 and it is getting harder to rouse ourselves out of our beds to get out on the road for our rides. We're trying to make it a full six month season - April to the end of September, but we've already lost one of our "Sue's" - Sue K. She's the first to succumb to the call of the gym opting to sleep in and work out indoors. Oh well, I can't say that I blame her a bit. Sue S., aka "Sue the Lawyer", "Sue" Ellen, and "A Boy Named Sue" Aaron and I all went out on Friday morning and were sure that it was going to be a terrible ride. Our path was blocked by the trash train on the tracks; "Sue" Ellen wasn't sure where we would be since we were late and couldn't cross the train tracks to get onto the bike path. She took off ahead of us and we couldn't catch up to her five minute lead and her long, grande cavallo legs. As we headed up Kelly Drive, we witnessed a terrible car accident, which brought out an ambulance, cop car and two fire trucks. The old original Catholic girl in me came out and caused me to bless myself as we rode by this scene of uncertain calamity. Once we were down onto Martin Luther King Drive aka West River Drive, the vistas became a bit more serene. We caught up with Ellen, or rather she was riding back up the drive and we finally crossed paths. The path was less crowded and as I always remark, the West Side of the river drive is bumpier but more civilized path because there are far fewer runners, skipping women, bikers, power walkers or roller blading fools dressed head to toe in coordinating yet garish sports gear. As we neared the waterfalls in front of Boat House Row, we were rewarded with a beautiful rainbow behind us. Perfect for a photo opportunity. I had my camera with me as I was hoping I could get the crew to all wear the same bicycle jersey that we all have, (a dreadful but extremely comfortable Michelobe Ultra Beer Jersey that Sue S. got from her brother, Bart, and his LiveStrong fundraiser prizes.) I wanted to take a group photo of all of us in our matching jerseys. Only Aaron and I complied, though Ellen doesn't have this jersey, yet. I'm not a fan of this piss-water beer. It's a terrible beer to advertise but the shirt is very soft and comfortable and from a distance the colours and design is sort of attractive. I like the royal blue and the long "V" design element on the back - it's a slimming effect, or so I've been told. Photo - Ellen, Aaron and Sue S., Rainbow courtesy of the Heavens. 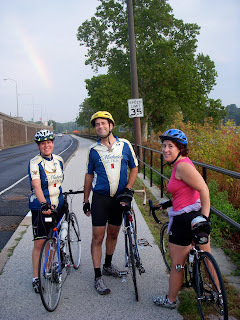 While we did not find our pot 'o gold at the end of the rainbow even with Ellen wearing a shamrock tee shirt, our luck did change on this portion of our ride, mostly it just was a nice ride with friends, nearing the end of our daily morning cycling season.